Hi all! As you can imagine, things have been pretty hectic here. I had to take some time off to attend to personal stuff (wedding, arranging house etc.). We have been going full steam at our sisters’ individual files. I am continuing work on identifying and scanning photos and am currently up to the “N’s” in our collection. In my responses to reference requests, when appropriate, I have been requesting families to send me photos of their family members! This week I got an email with an attached picture of Sister Collette McEveney – one of our sisters who I did not previously have an identified photo for – it was pretty exciting and very rewarding! Sister Juliana is continuing her work on weeding through documents that have not been processed before. Quite a number were vow formulas which have all been organized and filed away accordingly. Some were related to departures from the Institute and she is sorting through what items relate to our collection mandate. Addition to our records forwarded by a family member who had a genealogical reference request. 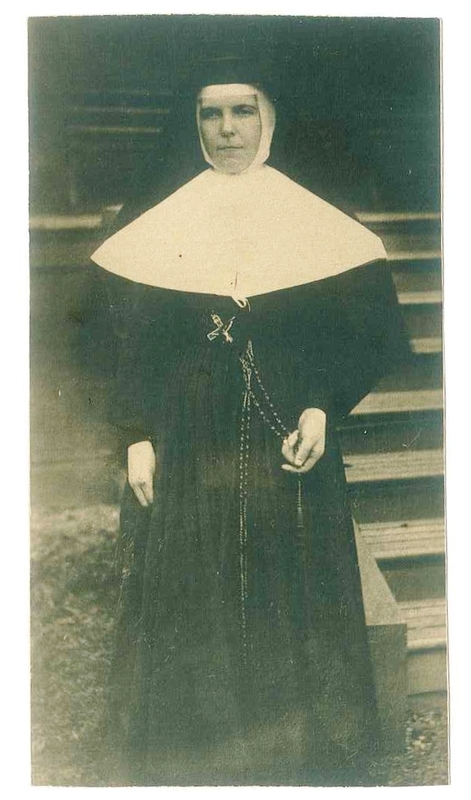 Sister Colette McEveney entered the Institute in 1905 and made final vows in 1908. She passed away at a rather young age – 31 years – on September 24, 1913 and is buried at Mount Hope Cemetery in Toronto, Ontario. 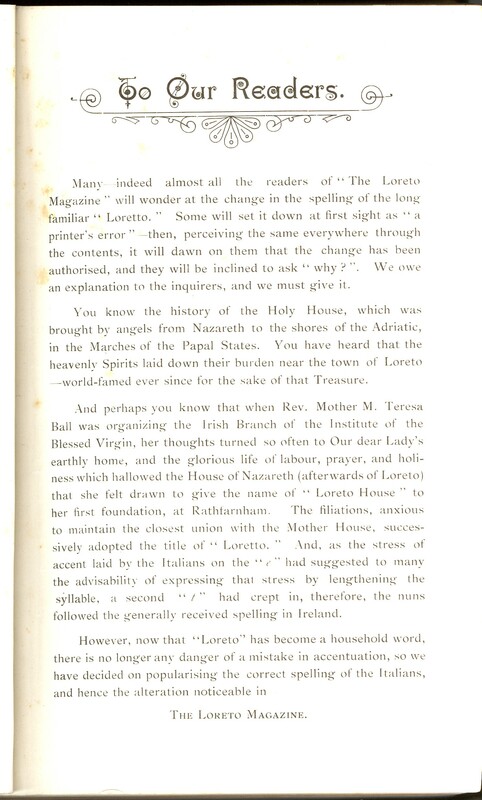 Also from Ireland’s Loreto Magazine in the Christmas edition of 1896, an explanation of the reason for the change of spelling of ‘Loretto’ to ‘Loreto’ which is interesting. While looking for something quite unrelated I found a reference to the teaching of Irish at Rathfarnham. This relates to an enquiry I had from Dr. Val Noone earlier this year. 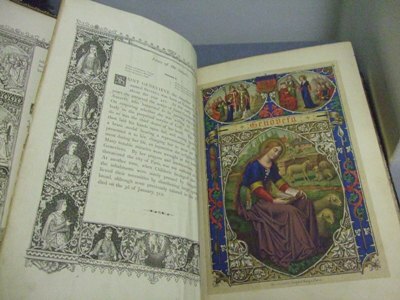 I am sure you have already seen it as it is in “The Loreto Magazine” 1899. But just for your interest. Also many mentions of magic lantern shows in this edition. Earlier this year, the Loreto community in Fermoy, Co. Cork made the difficult decision to move from their community residence to more suitable accommodation. We were anxious that any archival records retained in the community residence would be identified and transferred to the Irish Province Archives. Kathleen, after an early start, made an initial journey to Fermoy on Friday 27th July, and began the process of identifying archival records and making arrangements for their safe transport to Dublin. The highlight of the day was the chance discovery of a ‘Magic Lantern’, with accompanying slides. Kathleen had been hunting a ‘Magic Lantern’ for some time. We now hope at one of our forthcoming Archives Open Day to show a wonderful collection of glass plate slides from the early 20th century, taken by M. Michael Corcoran on her worldwide visitations, as they would have been originally viewed. A second trip was made by Kathleen and Áine in Kathleen’s red Toyota Yaris on Monday 30th July. A long but successful day of boxing records, moving the boxes from the second floor library to the waiting Yaris, before finally depositing our latest acquisitions in their new ‘home’ in Dublin….an exercise in logistics and space management!